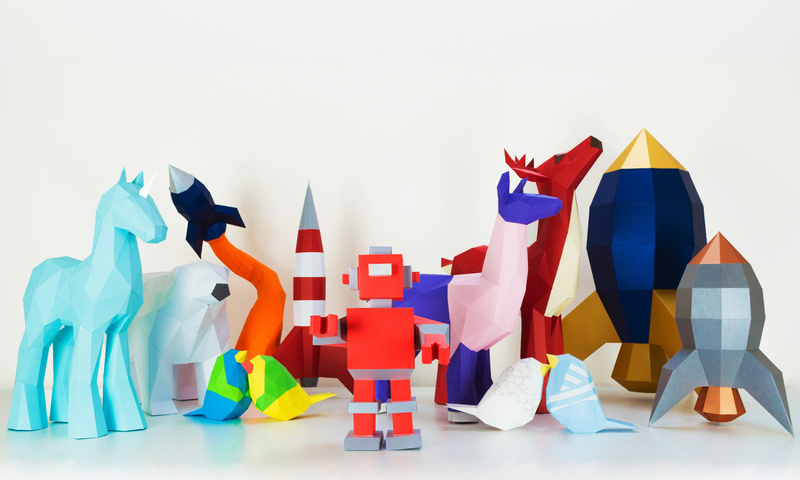 Sticking together your KaBlackout low poly papercraft is the most exciting stage of the creative process. Once you have downloaded and printed the template and cut out the components, then scored and folded them you will have a stack of card pieces just begging to be joined together into 3D life. How do you stick them? What kind of glue should you use to stick together the components of your KaBlackout papercraft trophy head or sculpture? 3D papercrafters mostly use PVA adhesives, sometimes called white glue or carpenter’s glue. This type of glue is available in bottles and pots under many brand names world-wide, Mod Podge and Elmer’s are two of the best-known. It’s usually not very expensive to buy from craft shops or DIY stores. A typical PVA (poly vinyl acetate) glue is a runny white fluid which rapidly dries in air at room temperature to make a firm bond, turning clear as it sets. How do you use PVA glue to create your paper sculpture? My first tip is not to use the glue straight from the container, because exposure to air causes it to set and if you are working for several hours on your sculpture the glue in a container will thicken and skin over. Instead I suggest you pour just a small amount into a small dish or paint palette, adding more as you use it, then close up the container again. My next advice is to apply the glue to the tabs on the papercraft pieces with a small paint brush. 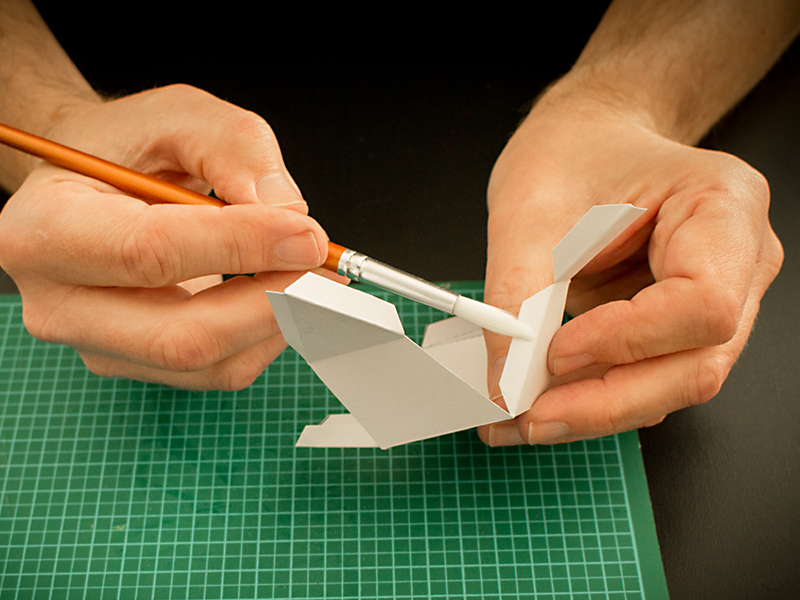 Remember with a KaBlackout papercraft template the glue goes on the unprinted side of the component. All the printed lines and number will be on the inside of your finished papercraft. To apply the glue, lift a little with the brush, and lightly spread the glue along the tab. You are aiming to have a thin wet smear along the tab, if the glue is applied too thinly it won’t adhere, if you put on too much it is likely to ooze out of the join and look unsightly. With experience you’ll quickly learn how to put on just enough. Glue on the ‘clean side’ of your template tab. Bring the glued tab into contact with the surface you’re joining it to. As the glue doesn’t set immediately you have a little leeway to adjust things if you haven’t got it in exactly the right place the first time. This does mean you’ll need to hold the parts together for a moment while the PVA glue catches. You can to this with light pressure with a finger or the blunt end of a paint brush. If any glue is squeezed out you can quickly wipe it away. Squeezing the parts together also helps make the bond stronger. With a larger sculpture like an animal trophy head I “paint” a little glue along glued tabs inside the sculpture after they have set just to give a little more strength to the finished papercraft. Used properly PVA glue is a nice safe adhesive for most people. It’s fume free and odourless so using it shouldn’t cause any complaints about bad smells. While swallowing it probably isn’t a wise thing to do it is not toxic and is harmless if it gets on your hands. Of course, follow the manufacturer’s safety guidelines on the packaging at all times and if you have any safety concerns about PVA stop using it and consult a doctor . As it is water soluble PVA glue is easy to clean up if you catch it before it sets. Wipe off spills and overflows with a damp cloth. If it has tried it can be carefully scraped off hard surfaces, while dried PVA can be removed from fabric by soaking it in warm water before rubbing it with laundry detergent. PVA glue is not the only product you can use to stick your KaBlackout papercraft together but in my opinion it is the best as it’s cheap, safe and easy to use. What do you think? I’d love to hear how you make your papercrafts in the comments. I have seen conflicting instructions. Blast Off Rocket guide says “always glue on the ‘clean’ side of the tab and not the printed side. Which is it? Printed or “clean” side. Hi Tara, the guide is correct, there was an error on the website which has now been fixed. Thank for pointing this out and sorry about the confusion!